A beautiful piece of vintage 1984 Superman, Toyman original comic strip art by comic book artist Jose Delbo! This is the original art to the World's Great Superheroes daily strip from July 18, 1984 and features Superman and Toyman! The art on this comic strip was penciled by Jose Delbo and inked by the late Sal Trapani. Jose has signed the art just above the last panel. PLEASE NOTE: This is a hand drawn, hand inked piece of published Superman, Toyman original comic strip art, not a print, copy or facsimile! 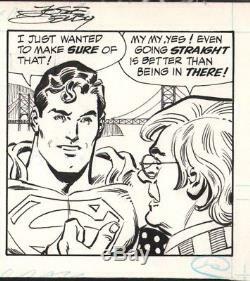 This 6 X 16 1/2 inch piece of comic strip art on bristol board is in excellent condition and would make a great addition to any Superman, Toyman, Jose Delbo or Sal Trapani collection! It could also make a GREAT GIFT! These charges are the buyers responsibility. And, check out my other auctions for great original comic book art! The item "JOSE DELBO SIGNED SUPERMAN, TOYMAN 7-18-1984 ORIG. COMIC STRIP ART-FREE SHIPPING" is in sale since Tuesday, November 28, 2017. This item is in the category "Collectibles\Comics\Original Comic Art\Comic Strip Art". The seller is "stevo861" and is located in Fort Lauderdale, Florida. This item can be shipped worldwide.